5 Solutions to the BIGGEST Home Theater Mistake! You have a vision of the family nestled on the couch watching the Hobbit on your own home theater system, without the annoyance of the big theater experience… somebody kicking the back of your chair, stepping on your toes to get to their seat, or texting despite the myriad requests not to. You establish a budget, do your research, narrow your choices and then move forward. All six speakers for your home theater system arrive. You know how to connect your front sound stage. The towers, center channel and sub all get hooked-up and balanced. You know the surround portion of the theater need to be connected as well, but how do you get the wires from the front of the room to the back of the room without a major construction project? So you put it off for another day, content with what’s already working. 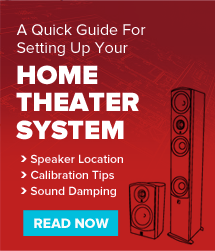 Fact is 85% of 5.1 home theater buyers NEVER CONNECT the rear speakers… the SURROUND SOUND portion of the whole system. Granted, the rear speakers only account for about 15% of what you hear in a typical movie, but they are the key ingredient in the surround experience. They provide the surprise elements of the sound track… the twig cracking behind you in the horror flick, the plane fly-by in Top Gun, the echoes of the Trolls thundering through the caves in the Hobbit. Without them, you’ve just purchased a wonderful upgrade to your flat panel TV speakers. Get the immersive experience 5.1 has to offer by solving the connection challenge of your rear surrounds. Buy an area rug: for placement between your TV and your listening area and run the wires under it to your surround speakers. That’s the solution I’m currently using for my system our basement entertainment room. The cement floor prevented me from drilling a hole in the floor and using the crawlspace to run the wires to the back of the room. It was a simple, elegant and inexpensive solution that not only solved the problem for less than $100; it also helped improve the look, feel and acoustics of the room. Go wireless: There are a number of wireless solutions that can connect your rear speakers to your receiver. No surprise that one combination is and Aperion solution. Simply pair the Aperion Allaire Home Audio Link with our new Allaire Bluetooth speakers. Place the Allaire Bluetooth speakers in your surround positions, plug in the Home Audio Link “Receive” unit to the back of the Bluetooth speaker amplifier, connect the “Send” unit to the surround preamp outputs on the back of your receiver and voila… you have wireless surrounds that are controlled by your receiver. Get out the drill: If your home theater is on the first floor of your home, AND you have a crawlspace, simply drill a hole in the floor close to the wall by your receiver, another hole under your couch, dive into the crawlspace and feed the wires you need down one end and up the other. I know, it requires actually drilling into your floor, an uncomfortable few minutes crawling around in the dark and dirty space under the floor, but it provides an elegant and fairly easy solution to a worthy challenge… and you get to use a power tool. Hire it out: If none of the solutions above work for your circumstances, it’s time to call a professional and buy an hour or two of their labor to do it all for you. Someone in the low voltage services (home automation, cable service, security and internet setup) will fit the bill. They’ll have all the tools and know all the tricks available to solve the issue. One of these choices will more than likely solve your problem and help you avoid the biggest mistake most of us make when we buy a home theater system. Why pay for the immersive benefit of surround sound and not enjoy it? I love the moments during a movie when one of my family or friends looks around for the object effect or person sonically, but not physically present. It makes all the difference when the surrounds are connected. It’s a challenge worth solving.